ImmQuant is a software for studying the physiology of immune-cell types in complex tissues on the basis of gene-expression data, without the need for experimental cell sorting. The protocol begins with the uploading of transcription profiles of one or several samples from a complex (heterogeneous) tissue. 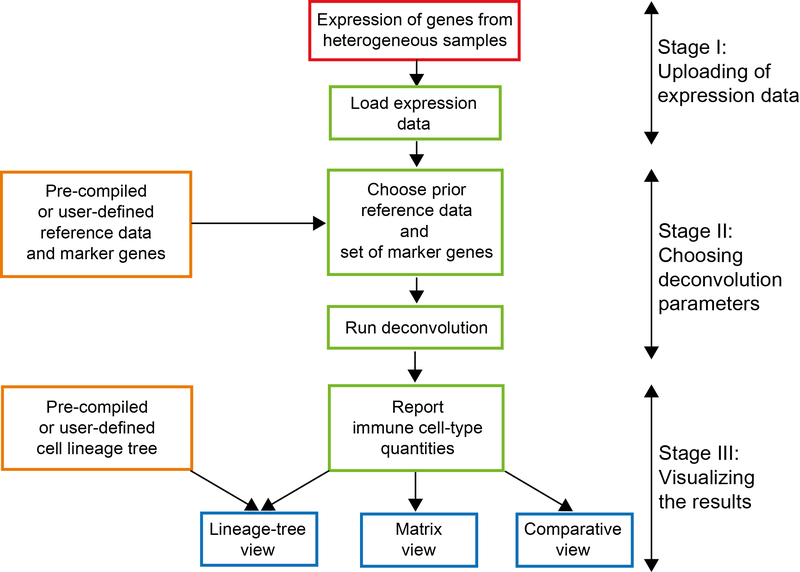 Based on these data, ImmQuant applies computational deconvolution techniques to predict the quantities of various immune-cell types within each sample. The software is freely available and can be installed and operated on Windows as well as on Mac. (1) Uploading of expression data. (2) Specifying the requested deconvolution parameters. (3) Visualization of the inferred relative immune cell-type quantities. The flow chart below illustrates these stages. Red indicates the required input gene expression from heterogeneous samples. Additional input files (the reference data and marker genes) are already pre-compiled within ImmQuant for both human and mouse. ImmQuant also allows uploading of user-defined files instead of the pre-compiled files (essential in the case of non-human/non-mouse data; orange rectangles). Blue rectangles indicate the visualization utilities of the inferred relative cell-type quantities. Green rectangles mark the different steps provided by the ImmQuant software.